Hello, Friends! Today I want to share with you something I never heard of until this week. It’s called Limber Tail Syndrome and my poor Lacey girl has a bad case of it…. My husband and I have been super busy the last few weeks getting our younger son moved from New York to Washington, DC. Therefore, we’ve had to leave our dog Lacey behind for hours at a time and once she went to the babysitter overnight. But usually if we are only gone for a few hours, we leave her outside in our backyard. Last Wednesday I left her out back for the entire day while I helped my son finish unpacking. (It was a pretty, sunny day.) My friend checked on her and fed her dinner and texted me that she was fine. But when I got home my husband and I noticed that Lacey seemed nervous and restless. We thought she was upset at us for leaving her alone. But the next day we realized that she was having trouble sitting down and was not wagging her tail. The fact she wasn’t wagging her tail was alarming! Normally Lacey struts her gorgeous tail like a peacock and she wasn’t lifting it or wagging it at all. Because I didn’t realize that Lacey wasn’t wagging her tail until Thursday evening I looked up her symptoms on the internet. I discovered she had what is called “Limber Tail Syndrome” and is most common in Labradors and Golden Retrievers. The technical name is Acute Caudal Myopathy. During the acute stage the tail is limp and hangs down and can be quite painful. The condition is similar to a sprained muscle. It can be caused by over exertion, over training, trauma to the tail, swimming in cold water or being in a crate for too long. None of these things seem to apply to Lacey. 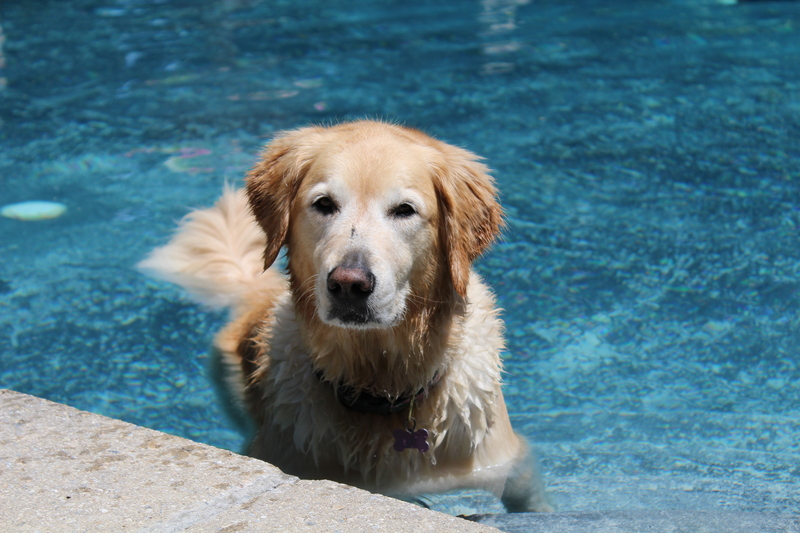 She has been swimming since she was a puppy and the pool is like bath water. (and she is NEVER in a crate.) This is how Lacey looked a few days ago. You can tell she wasn’t feeling well. Poor girl! Just to make sure Lacey was okay I took her to the vet. He examined her tail and hips and found nothing except a red place on the under side of her tail, which he said could have been caused by a sting or bug bite. Luckily our vet is practical when it comes to extraordinary measures to treat his patients. He said he could tell her tail wasn’t broken just by feeling it. (Also he said if it was broken she would have bitten him in the face!) Because Lacey is eating and going potty as usual, he didn’t see any reason to treat her. So, no x-rays or blood work for now. I just need to keep her quiet and she should be back to normal in 7-10 days. I love this girl so much. Because there is no treatment for Limber Tail, we will have to wait it out. I can already tell Lacey is feeling better. Last night after dinner she ran and got her Big Lambchop and played with her for the first time in days. She is starting to raise her tail up higher and is starting to wag her tail again. I’m SOOOOOO relieved. I want my sweet girl back to her spunky, active self! Meanwhile, I”m supposed to make her get plenty of rest which means no swimming or playing frisbee, which is torture for her. We still aren’t sure what exactly caused Limber Tail Syndrome in Lacey. The vet couldn’t explain it either since we didn’t think there had been any trauma or over exertion. He said many times they don’t know what causes it. (Also make sure young children don’t tug on a dog’s tail as this can cause a sprained tail too.) We think maybe Lacey’s was caused by an insect bite? It doesn’t appear to be a chronic condition so hopefully she won’t ever get it again. Preparing for Hurricane Irma 2017…. Evolution of Our Backyard in 15 years! Your story is exactly ours! Our Isabella, an English Cream Golden Retriever, was outside with me when she ran across the street to greet our neighbor and suddenly turned, looked at me and ran back with her tail down. She didn’t seem to be feeling well that night, so we took her to the vet the next morning. Just as with your Lacey, she found no break, (she did take an x-ray) but her tail was swollen about two inches down from the base, (I, too, believe she was stung or bitten.) We treated her with antibiotics and an anti-inflammatory for 10 days and the swelling is gone, but it has now been 2 weeks and 5 days since the “incident” and she is still not herself. She has a good appetite, normal bowels, like Lacey, and is wagging, but not raising her tail yet. She is also resting a lot. When you wrote your story, Lacey was getting better but wasn’t quite back to normal. I am just wondering how long it took before Lacey was truly back to her happy tail wagging self.